Top Congress leaders and their President Rahul Gandhi, who chose not to issue even a customary commemorative message on the occassion of 130th birth anniversary of Maulana Abul Kalam Azad and National Education Day, were also absent from a function organised in the Central Hall of the Parliament to honour one of the greatest sons of India. The only exception was Opposition leader in the Rajya Sabha Ghulam Nabi Azad who participated in the function attended by only three MPs besides Lok Sabha secretary. According to a report by ABP News, Ghulam Nabi Azad was disappointed that Prime Minister Modi skipped the function. But, he dodged the question why Congress President Rahul Gandhi and other party leaders were absent from the function organised to honour Maulana Azad – who was not only a front line freedom fighter along with Nehru and Gandhi but was also the party’s distinguished past president. 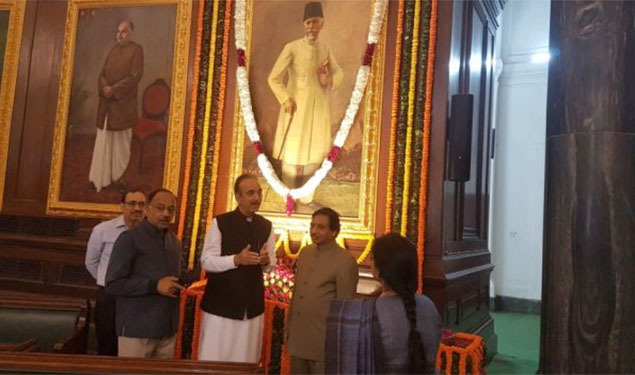 It was in stark contrast to that of Sardar Patel’s birth anniversary celebrated just 11 days ago when top Congress leaders including Rahul Gandhi, Sonia Gandhi and Ahmed Patel were all present along with BJP leaders in the Central Hall of the Parliament. What indicates that the decision by top Congress leadership to skip the Parliament’s Central Hall function to honour Maulana Azad was not an exception but could be part of its strategy to make people believe that it is not at all a “pro-Muslim” party. This could be the reason why the Congress party and its president Rahul Gandhi, famous for issueing statements on Twitter about every small and big things did no find it necessary to write few lines on the social media site about Maulana Azad or National Education Day.